Description: A spectacular freshwater cave formation in South Australia, where spring water filtering up through the limestone has created beautiful formations up the walls. Normally the water is crystal clear on entry, with limitless visibility. After swimming across the First Pond and through the fringing reeds, divers descend into the canyon-like Chasm, where the Dogleg at 40m can be seen from the surface. At the far end the Chasm develops a roof to form the Cathedral. 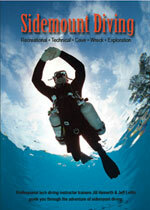 Dive pros Jill Heinerth and Jeff Loflin lead you through the fundamentals of sidemount diving in this comprehensive video guide.